Lyrics in Russian transliteration and English translation. 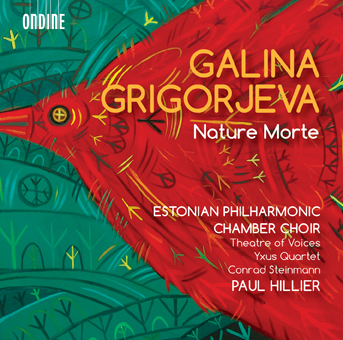 Ondine is proud to release this disc of choral works dedicated to Estonian composer Galina Grigorjeva (b. 1962). The works, recorded in the presence of the composer, are being performed by the Estonian Philharmonic Chamber Choir conducted by Paul Hillier. Galina Grigorjeva, originally born in Ukraine, is known for her deeply spiritual and timeless sacred vocal works. The title piece of the disc, Nature Morte, is a powerful spiritual work based on poetry by Joseph Brodsky (1940-1996). Some elements of folk music can also be heard in the vocal suite Svjatki which uses Russian folk texts. Other vocal pieces on the disc follow traditional Latin and Slavic liturgical texts. The recordings by the Estonian Philharmonic Chamber Choir have gathered positive reviews in the worldwide press. This recording is the fifth release by the choir on Ondine.